new chairs, originally uploaded by hep. back to school time is dangerous. after seeing evan off, getting the girls up, ready, and walking them to school, between morning dishes, housecleaning, and afternoon work i have a solid chunk of free time wherein i can peruse craigslist to find furniture i covet. this table can be somewhat hard to match for. 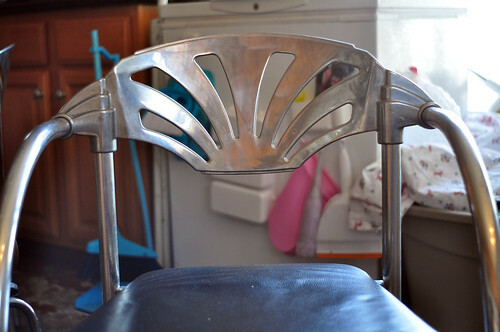 it is a bit lower than normal so most armed chairs won't slide under. i was super worried these would not, but they fit perfectly, almost as if they were made for this table. 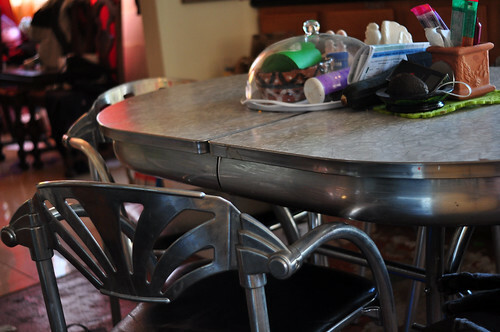 it is a non-standard formica dinette table, oval shaped instead of round or square, and it has a middle leaf that allows it to seat six, although i keep that in the garage since we never need it. 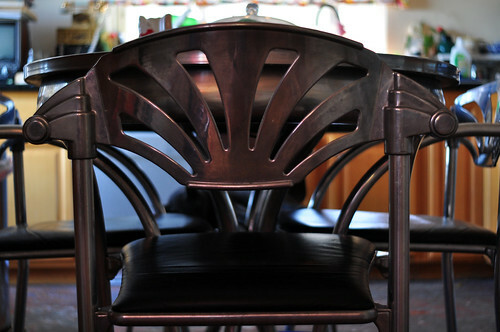 i will have to find 3 other chairs to sort of match it for when we have more guests. this is our kitchen table, we also have an old fashioned hardwood dining table in the dining room that seats 8, but we have already established that my dining table is a bikeshop. please ignore the state of the kitchen floor. the finish on it is cuban style concrete wash, but i haven't had time to redo it in about 4-5years (you are supposed to redo it yearly so the layering patina effect starts to work. 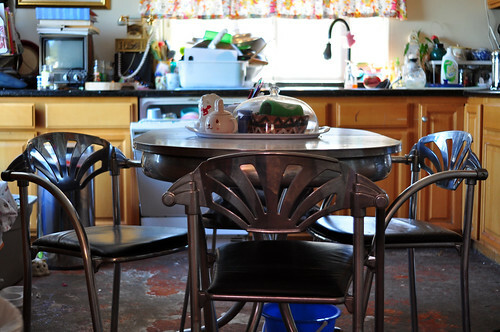 however it requires being off the floor for 72+ hours and this is the kitchen, the most used room in the house) so it is really showing wear where the stain has rubbed off. 40 years ago the kitchen was the sundeck, so they never planned for a real floor in there. hopefully come winter i will be able to arrange to have the kitchen sealed off for a few days to redo it. it's on my list ok.
my style is so eclectic, much like my clothing. i love mix and matching eras, finishes, wood and stone grains, etc. mostly i like things that are bright and/or shiny. i use this same tack for clothing purchases and the wearing of style, however apparently what i thought was just how everyone wears clothing (ie mixing and matching different items) is some sort of sf based style wherein we refer to our social circles/geographic locales as "tribes" or some other dumb nonsense. leave it to the nytimes to take something thousands of people have been doing since we started recording history and defining it as a style or movement among caucasian upwardly mobile classes. lol white people. anyway, i love these chairs! now if only i could find a buffet to my exacting specifications! 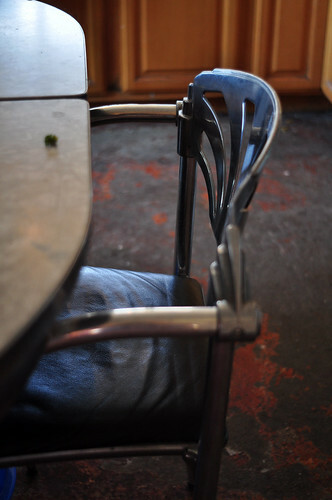 i LOVE LOVE LOVE diner tables/chairs/anything 50s or vintage inspired. when i move out i plan on decking my place out in entirely 1950s-1960s-1970s furniture. They totally look like a set with your table. They're great. I most most dining room furniture, no offense, but especially in America. Most of it looks really dated in a bad way and suburban-tacky, poor design, etc. Yours are awesome. My spare bedroom that was supposed to be an office is a bike shop / parts graveyard. I feel your pain. I was actually going to comment on how cool your floor looked. The chairs are nice, too! shiny!!! 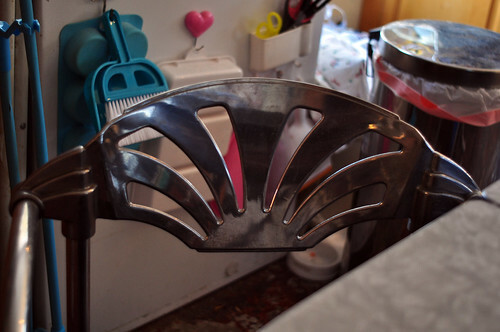 also, i've never seen chairs anything like them. neato.